Life is all about balance, right? I use a lot of high end products but sometimes, budget beauty really impresses me and today I want to share some of my favorites with you! Until recently, I had never really loved a budget foundation but a last minute dash around CVS means that I have two that I really love in my stash. The first is Maybelline Fit Me Dewy & Smooth, which I thinking might be exclusive to the U.S. because I can only find a matte version in Boots/Superdrug. This definitely rivals a lot of my high end foundations! The finish is radiant more than dewy and the coverage is medium but buildable. What I really love about it is that it glides over pores and fine lines and gives a smooth, flawless look to the skin. I think it's very similar to Nars Radiant Longewear Foundation, which is one of my favourite base products. I also find it pretty long-lasting - a good 8-9 hours before it needs a little touch up. Overall, I would highly recommend giving this foundation a go if you can get your hands on it, if you have dry skin and you like a radiant finish. The other foundation is from L'Oreal, and until recently it wasn't available this side of the Atlantic. L'Oreal Infallible Pro Glow foundation definitely live up to the glow in its name, which I really love but I wouldn't recommend it for those who are oily and even those with combination skin would need to powder a lot. Like the Maybelline foundation, the coverage is medium and both are lightweight, which makes them both very comfortable to wear. The wear time on this one isn't quite as good as Fit Me - I find that it breaks down a bit at the side of my nose at around the 6 hour mark, but I can top it up without looking cakey so it's all good! I'm very fussy when it comes to mascara - I like lots of volume, non-crispy lashes, I don't want it to smudge, be very black and non-flakey. I generally use high end mascaras but there are two budget brands that tick my boxes - L'Oreal Lash Paradise and Catrice Lashes To Kill Instant Volume Mascara. Both have full fibre brushes, which I personally prefer to plastic. Both add volume - the L'Oreal one is probably a bit more dramatic, both give very black, smudgeproof lashes and they don't make my lashes crispy. I think the Catrice one would be perfect for those who like their lashes to look voluminous but not necessarily the full-on false lash look. The Catrice one is also available in a waterproof version, which I'll bring on holiday in June to test and I'll report back - I've yet to find a mascara that is actually waterproof so I'm curious! My lovely friend, Leanne, gave me the gorgeous Sleek Solstice Highlighting Palette for Christmas and it was my first Sleek product, which is crazy given how popular the brand is! There are 3 powder highlights and one cream highlight - the consistency of the powders is really creamy and the pigmentation is intense so a light hand is needed. The quality is brilliant, regardless of price but given that it's a budget brand, it exceeds expectations! 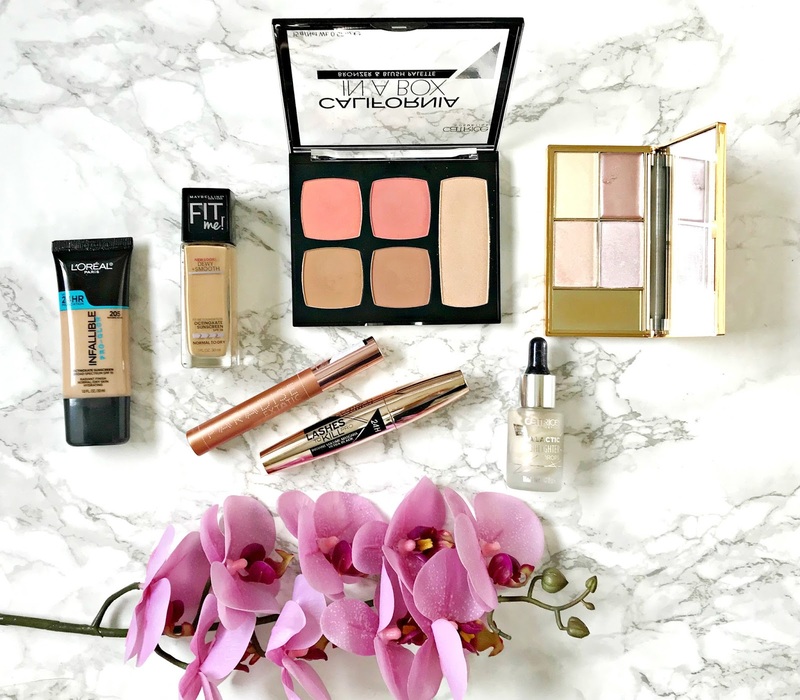 I was recently sent a bundle of Catrice products and I don't know why I hadn't tried the brand before! The Galactic Highlight Drops look scarily white in the pot but they actually blend to a beautiful pale gold colour once applied. The consistency is slightly thicker than Cover Fx Drops but they can be dabbed in with a beauty sponge or fingers and they don't budge my base. I've also added a drop or two to my foundation and loved the results. If you've wanted to try a liquid highlight for a while, then I'd recommend starting with these! Also from Catrice, is this California In A Box Blush & Bronzer Palette. It contains two matte bronzers - one to contour and one to bronze, a matte blush, a shimmering blush and a light gold highlighter. The texture of the powders is soft but not so soft that it will gather when applying and the shades are perfect for my medium skin tone.The highlighter can also be used as a blush topper if you want to up the ante and it also looks great layered over the highlight drops for a more intense look. Overall, I am very impressed! Are you a budget beauty fan or do you prefer high end products? There are definitely some gems to be found in the 'drugstore' in my opinion! I'd love to hear your favourites! All products are bought by me, unless otherwise stated. I was kindly sent the Catrice products. Opinion is always my own.